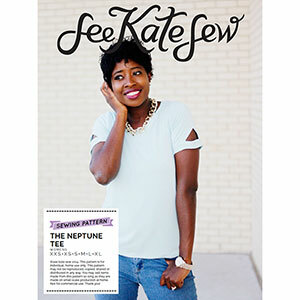 The NEPTUNE tee is a basic t-shirt with a twist! This tee has triangle cut-outs at the sleeves and front and back neckline. Choose to add all the cut-outs, or leave some out. 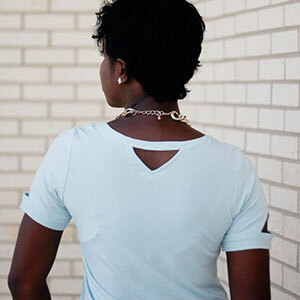 Create a really unique top with inset fabric or lace. Omit the triangles for the perfect basic tee! 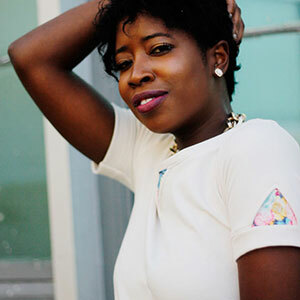 This top also has an optional slight curved or hi-low hem and banded sleeves. Suggested fabrics are light to medium weight knits with at least 30% stretch such as cotton jersey, cotton lycra, jersey rayon, interlock or ponte de roma. Lightweight knit is not recommended if you intend to do cutouts.